Definition: The selvedge refers to the edge of fabric as it comes off the bolt. The selvedge is the edges of the fabric which has manufacturer information. This area of the fabric is usually a bound edge that does not fray. Not only do I save the smallest snippets of fabric, I also save the selvedges. Check out the Quilts & Projects from Selvedges on Flickr for selvedge inspiration and ideas. Not too sure yet what I will do with my selvedges, but I will endeavour to expand my collection. 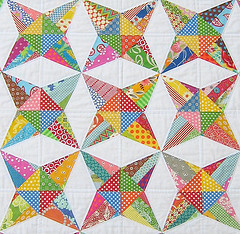 I have also received several inquiries regarding the spotty fabrics used in the Stashbuster Quilt. These fabrics have been in my stash for quite some time, I use them often, and I am always on the lookout for good spots in vivid colors. My advice is when you find a really good spot, (no wishy washy faded background, and good size white spots) buy a yard to stash. You won't be sorry, you will find you can use them often. As pictured from top to bottom the first two fabrics are by Piece O' Cake Designs from the "Sunday in the Park" range, and the last two fabrics are by Lecien who currently have an amazing selection of stripes and dots that would enhance any stash! A great stah of selvedges! And you can never have too much of a good thing - the spot that is! I've been saving my selvedges and plan to give them away on my blog at some point. I can't imagine I'd ever use them but hate to see them go to waste! You might be interested to look at the December issue of Down Under Quilts magazine, due out next month. I've written an article about selvedges used in quilts and there are two selvedge projects to motivate you. I love working with selvedges and have some pics on my blog if you are interested. Enjoy! 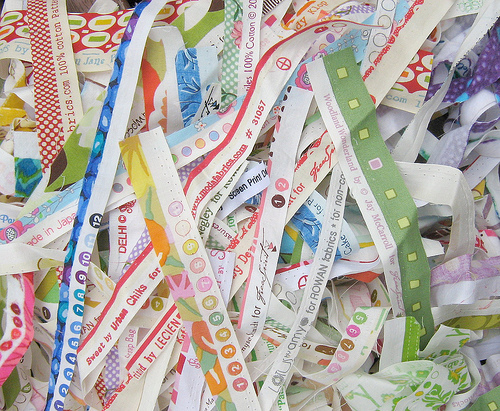 I JUST took a picture of a pile of selvedges that I ended up with after cutting some quilt squares. :D Mmmmm, I so love 'em. I love spots and stripes and always try to get quilters in my classes to use them if they haven't before. There are so many amazing spots and strips, I have a great collection of them, will take a picture and add to my blog later. I save my selvages too... one day I'd like to do something with them. Love the dots, especially the orange! I have been a long time spot collector myself and have many to choose from. I have several projects in mind, just got to get to them. Love yours! Great stash of selvedges - can't wait to see what they become! Can't wait what you'll do with the selve edges. 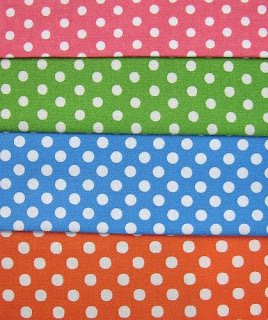 I am also always in love and search with dotty fabrics. They make your work look sparkling! This was the best Sunday Stash peek ever! I too have a lovely stash of selvedges AND I'm about to use the last of my Lecien pink with white dots (sigh)! Thanks for the reminders to use and save and use again! I just recently started saving my selvages. I can't wait until I have enough to do something with! My friend saved all hers, then sewed them across an apron - right through the middle, so the frayed edge was exposed. Super cute!